A Texas lawman risks his future to protect a woman from his past in USA TODAY bestselling author Delores Fossen’s latest Sweetwater Ranch book. 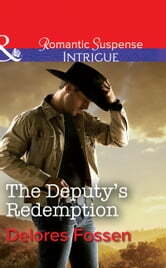 The woman fleeing a cold-blooded killer is no stranger to Deputy Colt McKinnon. Fourteen years ago, Elise Nichols was the love of his life. Now she’s back in Sweetwater Springs–to be the star witness in an upcoming murder trial that could tear the Texas lawman’s family apart. With her explosive revelations certain to rock the town, Elise didn’t expect to be welcomed home with open arms. Certainly not by the cowboy with the badge who once meant everything to her. But after being run off the road and shot at, she has no choice but to trust him. Even more dangerous is the desire that’s reigniting, making Elise yearn for something she may not live to see.